Happy New Year’s Eve! Lindsey and I had a tremendous 2012 by all measures, filled with family adventures, travel, and progress on the Double Dogleg. A few of the highlights were our baby-reveal brunch where everyone already knew what was happening, but played along gracefully. And later, the gender reveal party shortly after Thanksgiving. We are fortunate to have family that are present, engaged, and unbelievably supportive. They set a wonderful example for us through each day of our lives, and I hope that we are able to return the love and pass it on as well. Most exciting of all is the life we have ahead of us – the arrival of our son this coming April – the first grandchild for the family – the first nephew to his Aunts. When I think about my resolutions for the New Year, what comes to mind is that priorities will change – by choice – to putting our son first, focusing on being an awesome dad, and doing all that I can to support Lindsey as a mother. With that I resolve to say, “I love you,” everyday to Lindsey and baby boy – although I do already. And to hug them each morning and night. To make the Double Dogleg a safe and adventurous home. To work more efficiently, so that I can support them and be with them. Here’s to 2013 and beyond. May the rest of our lives be filled with more love, inspiration, and hard work than ever before. This entry was posted in Our Experiences on 31 December, 2012 by Chris. We did some bush whacking this morning to clear a sledding chute down the back of the Double Dogleg. Here’s a couple videos of me testing it out. Now we just need some more snow to cover up the leaves. This entry was posted in Home Ownership, Our Experiences on 30 December, 2012 by Chris. We had a wonderful Christmas Eve and Christmas with our families. On the 24th, we met at Sorellina for dinner, and then drove around to see the Christmas lights before attending the 9pm church service. No dropped candles or broken pews this year, although Christy did have a bit of a laugh-attach early in the service. Christmas morning had us up early shoveling a little snow, so that we could safely descend the driveway en route to Mom and Dad J’s house for early morning Christmas. It was fun to give Dan his golf club rack, which Lindsey and I built together. Then we were off to the farm to celebrate with Lindsey’s extended family. After enjoying some coffee cake, we opened presents, visited, and then returned to Old Mission Peninsula for Christmas turkey and gift opening with Mom and Dad R and Katy. Continuing with the home crafted gifts, we gave Mom and Dad R a footstool/table made from saplings felled on our property. I am anxious to see if it stands the test of time and the bites and bumps of Izzy and Calla. It was a wonderful day of celebration and relaxation, and we’re very thankful to have so much loving family close to home. Now its time to start thinking of my New Years’ resolutions! This entry was posted in Holidays, Our Experiences on 27 December, 2012 by Chris. It is a miracle if you can find true friends, and it is a miracle if you have enough food to eat, and it is a miracle if you get to spend your days and evenings doing whatever it is you like to do, and the holiday season—like all the other seasons—is a good time not only to tell stories of miracles, but to think about the miracles in your own life, and to be grateful for them. This entry was posted in Holidays, Quote on 27 December, 2012 by Chris. “The most dangerous way to lose time is not to spend it having fun, but to spend it doing fake work.” How to Lose Time and Money – Paul Graham. This entry was posted in Quote on 23 December, 2012 by Chris. The snowblower started right up, but wouldn’t keep going when I activated the drive or blade levers. I quickly abandoned that and returned to shoveling. It took about an hour and forty-five minutes to shovel the main driving areas of the driveway, which is good enough at this point. 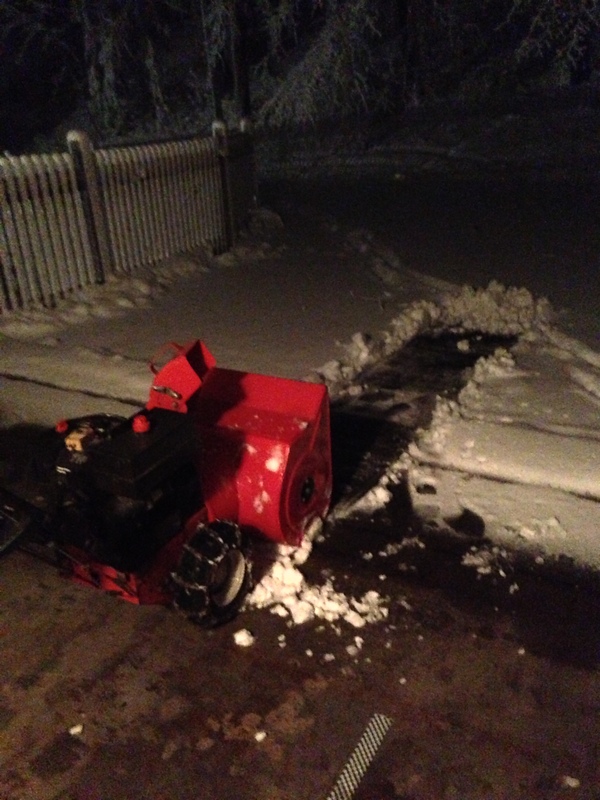 Hopefully, the snowblower will work better when it’s not 5am and dark. 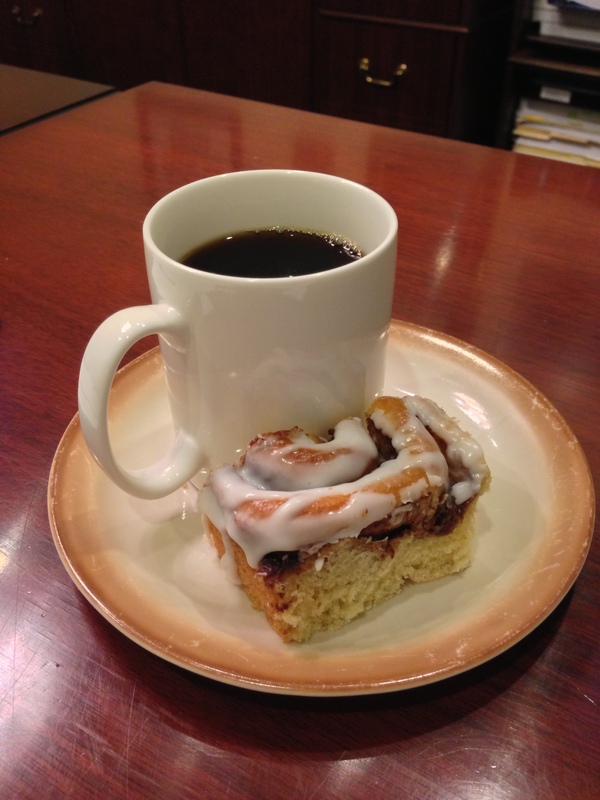 Time for work, coffee, and a cinnamon roll. This entry was posted in Home Ownership, Our Experiences and tagged 2012, coffee, double dogleg, house, shovel, Snow on 21 December, 2012 by Chris. Lindsey is often laying on the couch watching TV in the evenings, with her hand cupped against the lower portion of her baby bump feeling Mr. Rogers kick. She’ll get my attention and not only can we feel him kicking, but we can also see it when watching the baby bump. It’s unbelievably cool, although sometimes my presence appears quiet him. Naturally, we link this activity to Mr. Rogers’ potential future athletic prowess at such sports as soccer and track. And the next step is to think of names from those sports. However, the only two soccer names I know are Ronoldo and Pelé. Nothing against those names, but they are not at the top of our list! 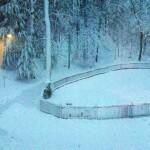 This entry was posted in Our Experiences and tagged baby, child, kicking, pregnancy, soccer on 20 December, 2012 by Chris. This is a typical morning for Yogi. He doesn’t wake up until I wake him up. If its before 7am, he’s not a happy camper. This entry was posted in Our Experiences and tagged 2012, dog, home, yogi on 20 December, 2012 by Chris.